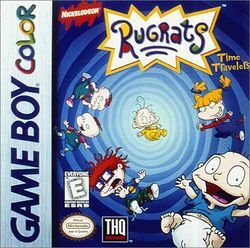 Rugrats: Time Travellers is a platform game which was developed by Software Creations for THQ and released for the Game Boy Color in November 1999; as the name suggests, it is the eighth title in the Rugrats series (and the second with inferior graphics & audio due to being released on GBC), but unlike The Rugrats Movie, it couldn't be played on the SNES with the Super Game Boy adapter. The game is also, like those of another original Nickelodeon cartoon, The Ren & Stimpy Show, based on several segments off the show (most notably "Toy Palace", where Tommy and Chuckie get locked in a toy store after it has closed for the night and activate a marauding robotic gorilla named "Thorg"). This page was last edited on 14 November 2016, at 17:01.